Toys and Joys is a plan and pattern company that provides full size drawings (18" x 24") for making detailed wood models and toys. 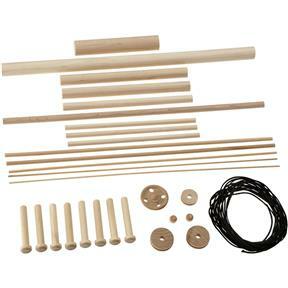 Their plans are excellent woodworking projects for the beginner or the advanced woodworker. Please note this is only the detail kit and plans are not included; see T27506 for the plans to make this hydraulic crane. Finished model is approximately 27" long. 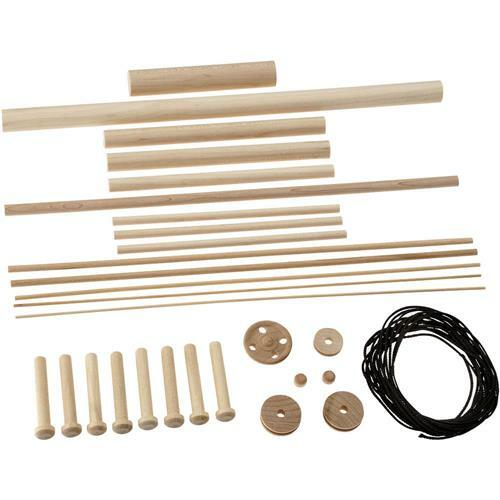 (8) Axel pegs 2-1/8" x 5/16"
(2) Dowels 3/32" x 12"
(1) Dowel 1/8" x 12"
(2) Dowels 1/4" x 12"
(1) Dowel 5/16" x 12"
(1) Dowel 3/8" x 4"
(3) Dowels 1/2" x 6"
(1) Dowel 5/8" x 12"
(1) Dowel 3/4" x 4"
Please note the wheels are not included in this kit. Instructions on how to make the wheels are included in the plans.